The Duluth International Airport (airport code: DLH) came to us looking for a video, and walked away with a whole new way to capture its experience. The forthcoming campaign rose from this simple idea: DLH is the local flying option, making it an economic engine that’s a connection point for our region. A connection to other cities, businesses and opportunities. After some brainstorming, our team realized that at the root of this idea was an energy. An energy that is reflective of and inspired by its home, the Twin Ports, and the surrounding region. When you #flydlh, you don’t wait in lengthy security lines. You don’t have to travel two and a half hours in traffic. Just like the region, at DLH, you keep moving. To reinforce the connection between the airport and its robust community, Swim and DLH buddied up to create a campaign that captured this movement. Plus, we got to fly in a helicopter. It was spectacular. Impressive. Bustling. Stimulating. The DLH energy played out in every scene of this video campaign. Instead of touting the airport, we focused our lens on the people and places around us. Working with local businesses, big and small, we captured the “up north” trailblazing spirit. The videos, set to upbeat and moving music, played across screens around the region, including the local university’s football games. What began as a video project became a powerful way for DLH to convey its connection to the community. The videos even inspired their own mini-campaign. And lots of DLH fervor. “We created a spot that spoke to our community pride—and the beauty and the energy of the region came through organically,” said Cody Paulson, Swim’s senior art director. DLH had four amazing videos. Now it needed to connect with its audience. 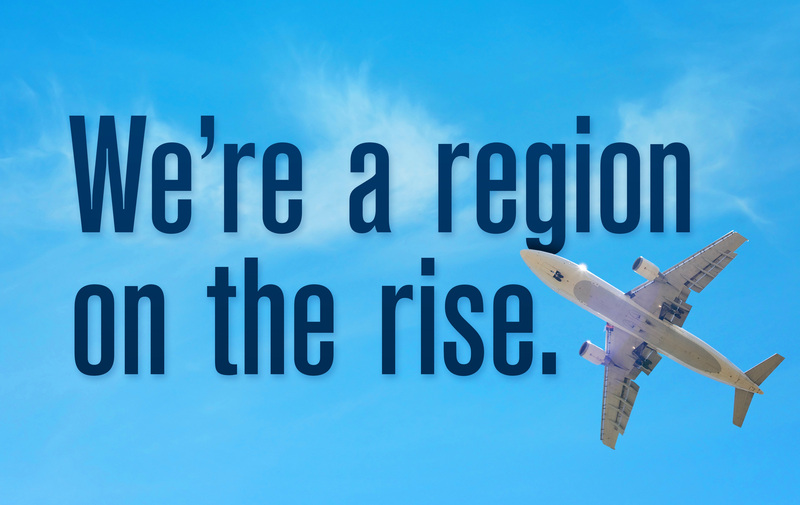 Using local radio ads, digital ads and local billboards, we gave rise to the Region on the Rise campaign. All ads directed people to the DLH site, with a custom landing page showcasing the videos and more information about the airport experience. Together, these efforts resulted in eyeballs on our videos while conveying that DLH was on the move across our region. To raise brand awareness and website visits, with the ultimate goal of booking more flights out of DLH, we published a mix of video and website click ads. Billboards were placed in the heart of Duluth, on the way to the range and in northern Wisconsin, all important and impactful communities of our region. DLH sponsored the local news, strengthening its community support message. On a spit of land call Park Point in Duluth, MN is the Sky Harbor Airport. This adventure seeker’s paradise is an amphibious air base that accommodates both land and seaplane traffic. It’s base camp for those who love the freedom of the skies. In tangent with our DLH videos, we created an anthem video for Sky Harbor. One that gave people a view of the airport through a pilot’s perspective. More venturous than DLH, it cemented Sky Harbor’s own story and personality. Together or apart, the videos stand as a testament to the region’s spirit.